After an early spell of attacking from Palace, in which Zaha showed the threat of his pace, City settled down to create some chances. Vardy, charging down the left, squared a ball for Nugent but at full stretch he could only send his effort straight at Speroni. Knockaert also forced a save from the Palace keeper and King sent a header over the bar, but after these early inroads City struggled to make an impression on a Palace side with a rock solid defence and plenty of pace on the break. Palace took the lead in the 23rd minute when Schmeichel claimed a Garavan corner but then dropped it after colliding with Whitbread – former-Fox Delaney firing the loose ball home through a crowded goalmouth. Five minutes later Palace further stunned the KPS with a goal that was all too straight-forward; Bolasie’s corner nodded home by Ramage from eight yards out. An impressive number of visiting supporters celebrated, and City’s 100% home record was already looking under grave threat. James came on for Dyer, in response to Palace’s three striker breakaways, and City managed a few attacking moves, the best of which saw Garvan heading clear from under the bar after Nugent’s instant turn and shot. Boos greeted the half-time whistle, but they were directed at the unimpressive officials, rather than the home team. At least the cheerleaders from the NFL’s Jacksonville Jaguars performed well during the break, to warm the cockles on a chilly day. City, looking frustrated and out of sorts, still struggled to make a dent on Palace, under the caretaker-management of Lennie Lawrence after Dougie Freedman’s departure. The desperation grew and when a couple of penalty shouts late on were turned down we knew it just wasn’t our day. Delaney’s ‘trip’ on Nugent was difficult to call and the ref thought Garvan had chested, rather than handled, Nugent’s header on the line. City finally punctured the yellow wall in the second minute of injury time when King met Knochesky’s cross with a well directed header. But it was too late. City need to bounce back from this rare disappointment, something that Nigel Pearson’s sides have been able to do in the past. Leicester: Schmeichel, De Laet, Morgan, Whitbread, Konchesky, Knockaert (Schlupp 77), Drinkwater (Marshall 63, King, Dyer (James 32), Nugent, Vardy. Unused Subs: Logan, Waghorn, Moore, Futacs. Palace: Speroni, Ward, Ramage, Delaney, Parr, Dikgacoi, Garvan, Jedinak, Zaha (Moxey 90), Murray (Wilbraham 89), Bolasie. Unused Subs: Blake, Easter, O’Keefe, Moritz, Price. Referee: Andy Haines (Tyne & Wear). Attendance: 23,646. Nigel Pearson made no changes to the side that drew at Birmingham, and after a couple of early forays by Brighton, City exerted an intense spell of pressure on the visitors, winning a series of corners. Waghorn then fired a long range effort at Kuszczak, before City took a 10th minute lead. As both players charged towards goal Nugent fed the ball to King, whose first effort was blocked by Greer. But the ball fell kindly for the Welshman who made no mistake with his second chance. It was a great start in front of the biggest crowd of the season but a chance to gain a comfortable lead was missed after De Laet made 60 yards progress down the right before teeing up Waghorn who blazed over the bar. Knockaert, who had a quiet first half but was to make up for it later, then forced a good save from Kuszczak before the game lost its momentum leading up to half time. The second half was more even with City conceding a bit of ground and Brighton being given room to get their passing game going. However City’s defence, well marshalled by Captain Morgan, weren’t unduly stretched until Whitbread was rather harshly judged to have brought down Buckley in the area, the ref looking happy to let it go before the linesman flagged. There wasn’t much wrong with Barnes’ spot-kick, placed low to Schmeichel’s left, but the City keeper reached it to pull off a fantastic save, Morgan diving in to thwart any effort from the rebound. With Marshall and Vardy on for Waghorn and Nugent City pressed forward with some delightful play in the last twenty minutes, Knockaert earning repeated applause for some fantastic passing and the odd party trick. The Seagulls did have a couple of chances however, with Barnes heading over while unmarked and then sending a late effort straight at Schmeichel. It was a night when City weren’t quite firing on all cylinders and they had to work very hard to beat a decent Brighton side, but they did. The mark of a side that deserves to be at the top. Leicester: Schmeichel, De Laet (Moore 56), Morgan, Whitbread, Konchesky, Knockaert, King, Drinkwater, Dyer, Waghorn (Marshall 71), Nugent (Vardy 68). Unused Subs: Logan, James, Schlupp, Futacs. Brighton: Kuszczak, Bruno, Greer, El-Abd, Bridge; Bridcutt, Crofts (Hammond 78), Dicker (Dobbie 60), Buckley, Mackail-Smith, Barnes. Unused Subs: Dunk, Calderon, Ankergren, Lopez, Lualua. Referee: Neil Swarbrick (Lancashire). Attendance: 25,726. Nigel Pearson brought De Laet, Whitbread and Waghorn in for Moore, St Ledger and Vardy and City looked the better side right from the start. Early panic in the Blues defence led to a foul on Nugent and Konchesky’s free-kick was well-struck but straight at keeper Butland. Dyer was then fouled by Hurst for an obvious penalty, but as was the case on our last visit to St Andrews, the referee somehow didn’t see it that way. Soon after Whitbread teed up Waghorn for a volley which Butland did well to save and Knockaert cleverly created a chance for Nugent who sent his effort wide. King then sent a drive whistling past the post before setting up Waghorn for the best chance of the game which he fired over. As the half progressed the number of chances for City grew to ridiculous proportions as a penalty shout for a Davies handball was turned down; Murphy blocked a De Laet effort, and Butland saved from Knockaert. City’s 4,000 followers then looked on in disbelief as Birmingham delivered a classic sucker punch in first half injury time, King charging forward on the break and delivering a low cross for Lovenkrands to slot past Schmeichel in their first serious attack of the game. If the Leicester players left the field feeling as though they had been mugged it almost got worse early in the second half when Schmeichel pulled off a good save to deny King. City were no longer dominant and had to wait until the hour mark for their next decent change when Butland tipped a fierce Waghorn shot over. Marshall and Vardy replaced Dyer and Waghorn in the 73rd minute and it was Marshall who rescued a point for City with four minutes of the game remaining, the youngster’s low shot from 25 yards going in off the right hand post. City almost got the points they had deserved deep into injury time. Spector’s trip on De Laet earned him his second yellow and Marshall delivered a perfect free-kick towards the top right hand corner, but Butland had the last word tipping it over at full-stretch. City’s winning streak was over, but Cardiff’s defeat at Forest meant that a point was good enough to see them top the Championship again. Birmingham: Butland, Hurst (Fahey 76), Davies, Caldwell, Murphy, Burke (Elliott 56), Morrison, Spector, Lovenkrands (Lita 63), King. Unused Subs: Doyle, Mullins, Packwood, Robinson. Leicester: Schmeichel, De Laet, Morgan, Whitbread, Konchesky, Knockaert (Futacs 82), King, Drinkwater, Dyer (Marshall 73), Nugent, Waghorn (Vardy 73). Unused Subs: Logan, James, Schlupp, Moore. Referee: Tony Bates. Attendance: 18,271. When and where are these Leicester City fans? Leicester fans in good voice during an away game, but what is the season and the ground? When Leicester got flooded out Poland v England style…. A torrential storm that started around kick-off time left the players splashing about for 23 minutes before the ref brought things to a halt. With the need to fill up news sites and blogs every day we often have to fall back on ‘On This Day in….’ type stories, but one that seems to have passed everyone by is the 20th Anniversary of the Leicester City badge. In the summer of 1992, following City’s defeat to Blackburn in the 1992 Play-Off Final at Wembley, Barrie Pierpoint’s vision for the future of the club began to take shape. Plans for a new stand to replace the old Main Stand were on the drawing board; the self-produced Fox Leisure brand replaced Bukta and kit suppliers; and a new club badge was commissioned. It was decided that the current badge, introduced for the start of the 1983-84 season, was not a strong enough image. The directors agreed that there was a badge that they liked and would like to imitate…. And it was this one… you may not have wanted to know that, but it’s true. Graphic Designer Chris Lymn, who now writes a column in The Fox every issue, was charged with the job and came up with the design that is so familiar with us today. The background of the cinquefoil came from the Leicester Coat of Arms. Chris thought that the old fox’s head and crossed riding crops was a little too county biased for a club that was housed in, and got most of its support from the city. The ears and snout fitting in the gaps left in the cinquefoil made for a very pleasing arrangement. The official third colour of a golden yellow was also introduced along with an imposing font that added to the strength of the design. Although the design on City shirts has been tweaked here and there: appearing in a shield, in a broader circle, with 125th Anniversary additional detail, and with the additional of a white bit round the muzzle, Chris’s basic design has remained intact for twenty seasons during one of the most eventful periods of the club’s history. 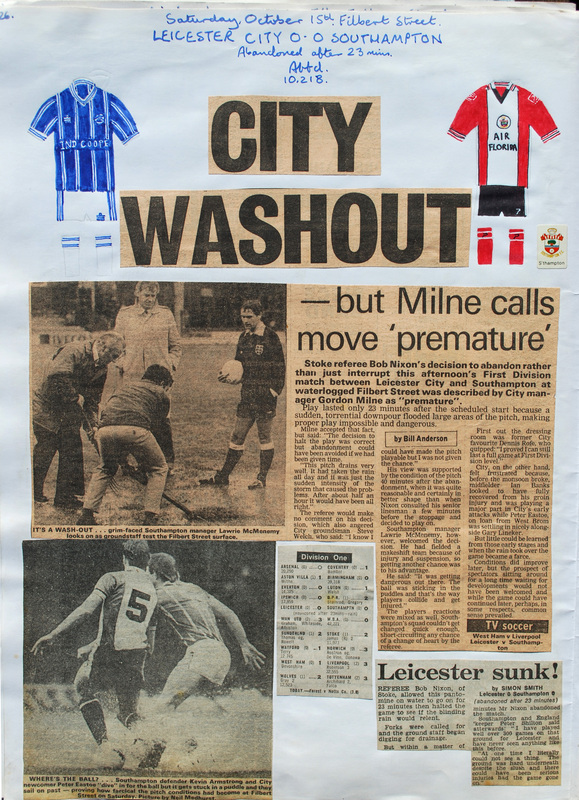 It made it’s debut in a 2-1 win over Luton at Filbert Street in August 1992. It’s all a bit serious these days, you don’t see too many players coming off the field laughing and joking, as though they have enjoyed themselves. In my four or five hundred games I never came off the pitch without having had a laugh and a joke. People say: “Well it was different in your day.” But I had a young family, I had a mortgage, I never had more than a two year contract. I just liked to enjoy myself. Do you remember the Leicester referee with the big mutton-chop whiskers, Roger Kirkpatrick? I was playing for Chelsea on a real marsh of a pitch and Roger was at his most eccentric giving it all that with his whistle and his gestures and running backwards at speed. He was getting on my nerves a bit and he happened to run past me backwards. I just could not resist putting my foot out and over he went on his backside in the mud. There were no close up cameras and lip reading then! I remember once we were coming out of the tunnel at Filbert Street for the second half against Arsenal and it was absolutely tipping down. There was a girl in the crowd next to the tunnel so I grabbed it as I went past and took it out with me. The ref did his quick check before kick-off and saw me standing there with it, but it was all a laugh. At the end of the game we were in the dressing room and Jimmy was addressing us all, and the dressing room after a game is sacrosanct for all kinds of reasons. There was a loud knock on the door. It was the pieman saying: “Birch, you owe me fifteen pounds.” It caused uproar!